I have always been the curious type. And a believer that, in order to really effect positive and lasting change in our lives, we need to go far outside the outer most limits of our comfort zones. We need to try something very new—often. Throughout my life, I have done this, and in my upcoming TEDx talk in Dallas on March 17th (TEDxOakLawn), I will tell you supportive stories and give you the recipe for how you can do this to change your life too. Here’s my latest something new. 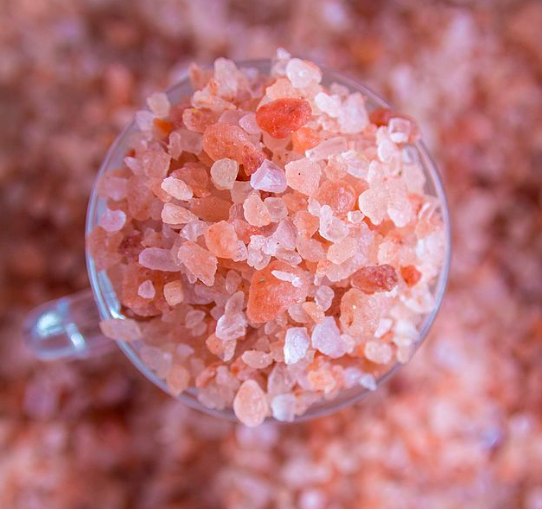 Deep in the Himalayas lies a type of pink salt that contains 800 million years worth of valuable minerals such as chromium, iron, zinc, lead, and copper and a plethora of negative ions that can balance your physical and mental state. Negative ions help your metabolism, can reduce headaches and can balance your internal chemistry; and keep your house freer of pollutants. It is impossible to get an overdose of negative ions, which act like pure water in washing away dirty poisons. Generally, the more negative ions you are exposed to, the better and more uplifted you feel. I know, sounds a little crazy. But sometimes we have to give something a try to see if it can benefit us. I spent an hour in a Himalayan Salt Cave and I can tell you that for me, it worked. I was feeling a little hurried when I arrived, as my list of to-dos was pretty long, which was the reason I went there. To unplug. To unwind. To get calm. I laid in this very cave, on a bed of pink salt, and covered myself with a blanket. I piled the salt onto my bare feet and dug my hands and arms into it. I was clothed otherwise. When I looked up, I saw thousands upon thousands of chunks of pink salt in a chicken coop type hammock attached to the ceiling. All around the cave were candle lit salt lamps and I could feel and smell the emission of salt spraying through the vents (or at least I felt the ions from the salt). Sound Therapy is so effective because it influences our emotional bodies as well as our physical bodies. Emotional imbalances are at the root of many physical diseases and when we heal our emotional bodies, the physical symptoms disappear. So I was game for the salt and the sounds. A woman’s voice filled the room next; inviting me to relax, breathe, listen and enjoy the effects of the ancient salt. I felt my heart rate decrease almost immediately and I paid close attention to how my body felt. I dozed off to the vibrations of gongs, violins, cymbals, ocean and whatever kind of sounds created the meditative music. 45 minutes later the music faded and the attendant opened the large cave door. I have to honestly say, I felt great. Calm. My sore calf wasn’t sore anymore. My sore right toe (which I had dug into the salt) didn’t hurt and I felt as though my lungs had expanded. I ended up buying a heart shaped lamp, made of Himalayan salt, which came with a few tea lights. It only cost me $7. Salt isn’t that expensive I guess. I put it on my desk and am writing with it next to me now. I was informed that Himalayan salt lamps have the ability to chemically and physically transform a room, and that they have unique healing effects. I have to say that, other than the peanut butter toffee cookie I had earlier today, I haven’t felt better! I don’t know if it’s the odorless, tasteless and invisible negative ions shooting through my body and healing me from the inside out, or if it’s the placebo effect; but either way, I am calm, I got a lot done today, I’m not sore from my workout and I am looking forward to a good night’s sleep. I’ll let you know if it lasts. Here’s to getting way outside your comfort zone and experiencing something new that can change you for the better. I think I’ll try floating in a dark, silent, water filled pod next week. I hear that many professional athletes do this to get rid of stress and negative thoughts, and to focus on their game. I’m not normally claustrophobic, but I guess I’ll find out. And, there’s a lot of magnesium in the water, which my doctor told me was good for cramps.